As soon as the DUT is hooked up to theR&S®CTH100A/ R&S®CTH200A via a BNC cable and an antenna or a load is connected, the R&S®CTH100A/R&S®CTH200A can start the measurements. If the transmitter is activated, e.g. by pushing the talk key, the test set begins by measuring the transmit frequency and shows the result on the display. The R&S®CTH100A/R&S®CTH200A simultaneously measures the forward and reflected power along with the frequency and presents the results on the display. The measured values are updated continuously so that any changes that occur will be displayed immediately. In this manner, it is possible to determine whether the transceiver's transmit module outputs the desired power. Using this measurement, the R&S®CTH100A/R&S®CTH200A can reliably detect any decrease in transmit power or a transmitter failure. Plus, the R&S®CTH200A can determine and display the VSWR from the forward and reflected power. The reflected power measurement allows the antenna matching to be determined for insight into the power that is actually radiated by the antenna. 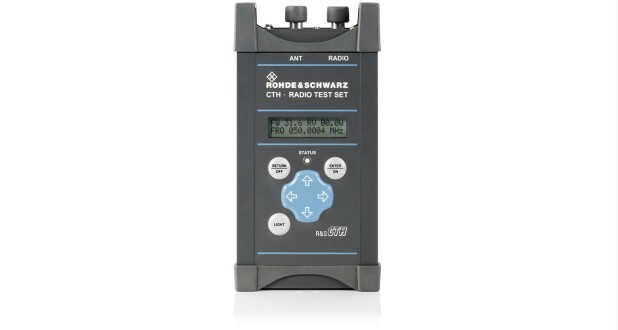 For a fast functional test of the transceiver, the R&S®CTH200A performs an over-the-air measurement. After the R&S®CTH200A's built-in antenna has been extended, the radio test set is able to detect and evaluate signals over the air. A bargraph provides information about the received power. Based on the transmit frequency which is also evaluated, it is possible to check the frequency accuracy and to verify whether the displayed power is output by the transceiver under test. Using this simple test, the entire setup from the transceiver to the antenna can be checked. This is useful when radio systems need to be tested just before they are put into operation and there is insufficient time for a complete functional test, e.g. in applications involving fire brigades. The R&S®CTH100A/R&S®CTH200A simultaneously measures the forward and reflected power along with the frequency and presents the results on the display. The measured values are updated continuously so that any changes that occur will be displayed immediately. In this manner, it is possible to determine whether the transceiver's transmit module outputs the desired power. Using this measurement, the R&S®CTH100A/R&S®CTH200A can reliably detect any decrease in transmit power or a transmitter failure. Plus, the R&S®CTH200A can determine and display the VSWR from the forward and reflected power. The reflected power measurement allows the antenna matching to be determined for insight into the power that is actually radiated by the antenna. For a fast functional test of the transceiver, the R&S®CTH200A performs an over-the-air measurement. After the R&S®CTH200A's built-in antenna has been extended, the radio test set is able to detect and evaluate signals over the air. A bargraph provides information about the received power. Based on the transmit frequency which is also evaluated, it is possible to check the frequency accuracy and to verify whether the displayed power is output by the transceiver under test. Using this simple test, the entire setup from the transceiver to the antenna can be checked. This is useful when radio systems need to be tested just before they are put into operation and there is insufficient time for a complete functional test, e.g. in applications involving fire brigades. 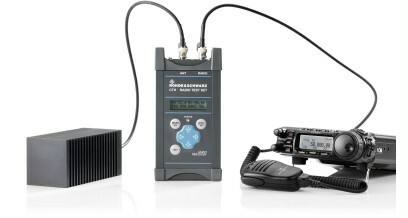 If the antenna is located at a significant distance from the transceiver, the R&S®CTH200A can check the connection between the antenna and the transceiver with its built-in cable fault finder. Based on the velocity factor, the R&S®CTH200A can adapt to different types of cables and precisely determine the distance to the fault. The R&S®CTH200A indicates if no antenna is connected and whether the connection is fault-free. The distance-to-fault measurement has universal applications and is not limited to antenna systems. The R&S®CTH200A can transmit the measured values via the RF connection to the transceiver for output over the DUT's loudspeaker. This makes for convenient operation even under extremely challenging conditions when it is impossible to directly read the display, e.g. in cramped environments or in the dark when there is no display lighting. The backlit display provides information about selected measurements, results and settings. The backlighting can be activated when necessary and dimmed in four steps for optimum readability of the displayed values. The lightweight test set is easy to transport even over large distances. Moreover, the compact R&S®CTH100A/R&S®CTH200A fits practically anywhere. Using the built-in eyelet, the R&S®CTH100A/R&S®CTH200A can easily be attached to a backpack or belt for fast access at all times. The R&S®CTH100A/R&S®CTH200A is operated using standard AA primary cells or rechargeable batteries. Various current-saving mechanisms are employed to ensure long operating and standby times. When the test set is not in use, it automatically activates the sleep mode to help minimize power consumption. All of the buttons are easy to operate. Plus, the test set is designed for operation with a single hand, providing equal convenience to both right-handed and left-handed users. 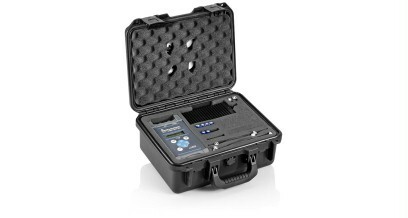 The R&S®CTH100A/R&S®CTH200A fits perfectly into its watertight transit case. The case protects the R&S®CTH100A/R&S®CTH200A against water, dust and shock. All of the R&S®CTH100A/R&S®CTH200A's accessories fit into the case, too. This ensures that the load, BNC adapter, batteries and cables are well protected and always to hand. The transit case has an automatic air pressure equalizing valve to make sure that the case opens easily even if air pressure conditions have changed. In the transit case, the R&S®CTH100A/R&S®CTH200A is well protected and immediately ready for use. The compact aluminum enclosure is rugged and very solid. The corners are rubber-reinforced, making the test set ideal for outdoor use. Enclosure, battery compartment, keypad and display are absolutely splashproof. As a result, the R&S®CTH100A/R&S®CTH200A is ideal even for operation under poor weather conditions. All of the components are designed so that the R&S®CTH100A/R&S®CTH200A can be used over a wide temperature range. This means that the R&S®CTH100A/R&S®CTH200A is the ideal companion for all seasons and climate zones.